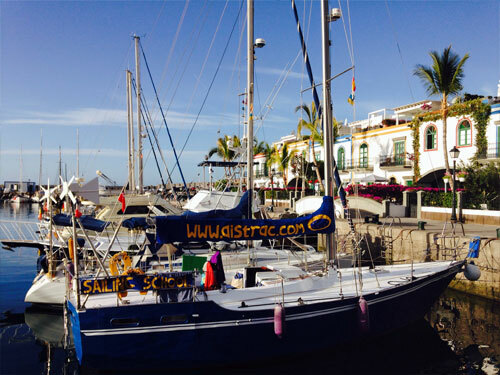 I received most of my sailing tuition in Canary Islands in the AISTRAC RYA school , on the purpose of setting good roots for further experiences in yachting . I was an almost total newbie ( did sail in Italy for just two weeks ) when I met Keith and Angela . From the very first moment I had the comfort of feeling that my expectations were recognized, and , despite not being a native english speaker, I always received an answer to the many questions I asked during the courses . My training went further, from Start Yachting up to Coastal Skipper, and during the time in which we were practicing along the beautiful southern coast of Gran Canaria, I found out that many advanced topics , like meteorology or reefing strategies, were at the reach of our hands : Puerto de Mogan is the perfect place to learn how to sail - in front of the atlantic, blessed by the daily breezes of Gran Canaria, few miles off the gulf stream and a fiery acceleration zone . AISTRAC is a school built upon the purpose of providing a classic, careful training to each person willing to learn how to properly sail . It adheres fully and well beyond the RYA syllabus . Its training yacht , Kinetic, will put you in the right conditions to learn : tidy, comfortable , and incredibly seaworthy . You will be surprised on how your vacation will become a milestone, or, differently, your training will be a personal experience . I did reach other RYA schools during my RYA training, but AISTRAC provided a service and a human touch which stills remain unmatched . One more serious bit . . . After few months from my training in Puerto de Mogan, I passed the Yachtmaster Coastal examination . On debriefing , I asked the examiner which in his opinion is the best school to attend to learn more . His reply was "a single instructor school on a single yacht fleet - they will give you real training and enhance your weakest side due to their personal, non formal approach" . This is what AISTRAC is : a school made for students by a professional teacher ; not just a business or a ticket factory . I really do warmly recommend AISTRAC , and look forward to return for my Yachtmaster Ocean tuition .